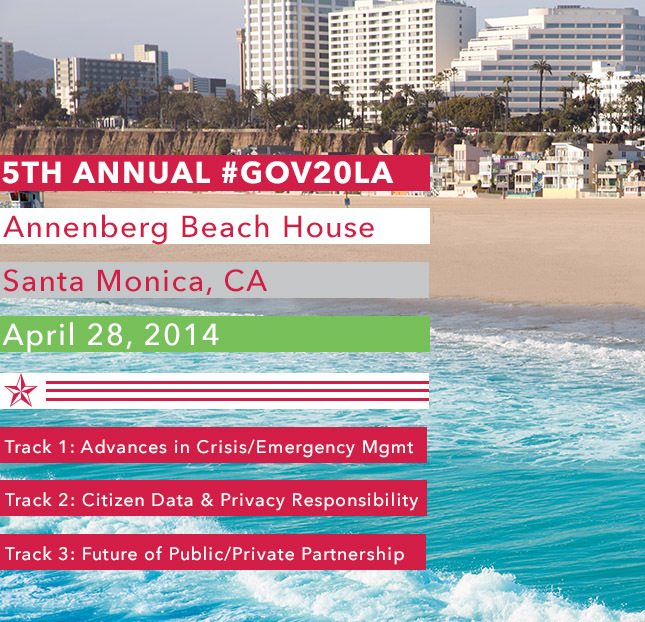 Gov20LA Addresses Data Security, Privacy Risks at the upcoming event on April 28. After the alarming gap in one of the Internet’s key security methods *Heartbleed* was announced, even organizations that have taken precautions find themselves exposed to risk. Important data such as customer credit card numbers, home addresses, website passwords, and even health records are at stake. A large percentage of organizations have never had a true security audit. How do CEOs, CTOs, Product and Data Managers know if their proprietary and customer data is secure or not? What are risks with 3rd party payment systems? What to do if you have a shared SSL? What is protocol for employees using their own devices? Do you need to share cyber breaches with authorities or not? Tickets to attend the talks live are limited and are available in advance at http://www.gov20la.com. They will be given on a first come, first serve basis and are expected to go fast. To watch the live stream, people are encouraged to RSVP to the Facebook event page to receive updates and a reminder before the live stream begins here: http://bit.ly/GOV20LA2014. GOV20LA, an intimate and powerful conference brings together innovative leaders at the intersection of government, tech, and businesses from around the world in an apolitical setting. Every year, the conference covers breaking topics affecting citizens at large with leaders delivering insights into current gov tech issues and cutting-edge technology in an open town hall format such as the Darknet presentation by General Manager of Intel Cloud Services Peter Biddle and the Award-winning Social Media efforts of NASA JPL’s Mars Rover delivered by Veronica McGregor and Stephanie L. Smith at the 2013 event. USE THE SECURE REGISTRATION PAGE TO PURCHASE TICKETS OR IF YOUR COMPANY WOULD LIKE TO SPONSOR THE EVENT. THANK YOU FOR YOUR SUPPORT AND WISDOM OVER THE YEARS. THIS EVENT IS NOTHING WITHOUT THE AMAZING SPEAKERS AND SUPPORTERS. This entry was posted in Gov 2.0 and tagged Alan W Silberberg, Cities, Data, Digital Diplomacy, Digital Rights, Gov 2.0, Gov 3.0, Gov20LA, Gov20LA 2014, Nations, Privacy, Public Private Partnerships, Security, SMEM, Social Media in Chaos, Social Media In Emergency Management, States, Surveillance, Twitter, Youtube. Bookmark the permalink.